We’re officially a couple of weeks into spring now, and Georgia is turning green - but, not just because of leaves returning to trees or flowers blossoming. It’s because everything is covered in a thick layer of pollen. I don’t know if it’s my allergies or dreading the 100 degree weather that’s bound to show up soon, but I have been dragging my feet when it comes to switching out my winter decor for my spring decor. If that sounds like you, then keep reading. 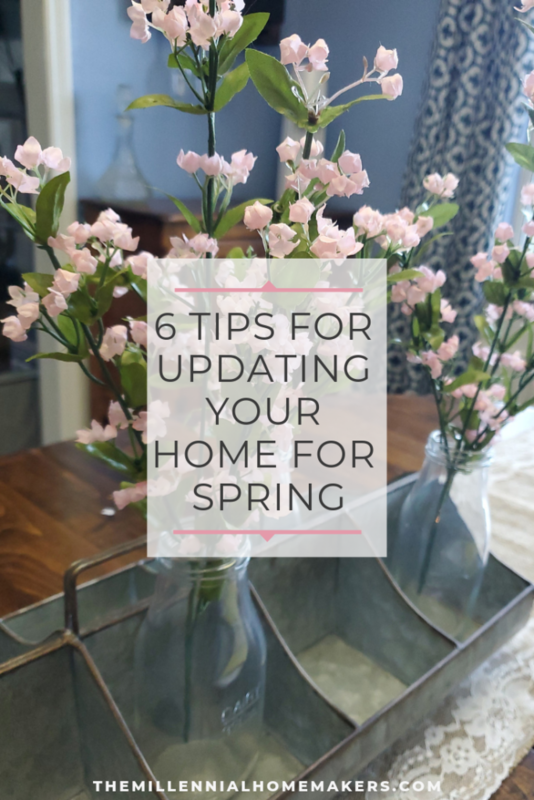 I’m going to share six quick and easy tips for bringing your home into spring. Disclosure: Some of the links below are affiliate links. All that means is that at no additional cost to you, we will earn a commission if you click through and make a purchase. If you’ve had chunky blankets on your couch to cuddle up with during the cold months, it’s time to pack those up and switch them out for light-weight blankets. It can still get chilly at night in the spring (or when the A/C kicks in), so you’ll still want to curl up with a blanket. But, you don’t need cable knit blankets anymore. You can also switch out your throw pillows for ones with brighter colors and fun spring patterns and change out the sheets on your bed. By packing up your winter textiles and replacing them with spring blankets and patterns, you’ll quickly see that your house looks like spring. Decluttering is a huge trend right now. Just look at what’s come out in the past year - Cozy Minimalist Home by Myquillyn Smith, Marie Kondo’s show on Netflix, and Clea Shearer and Joanna Teplin just release their new book, The Home Edit. If you listened to our latest New Year’s Resolutions episode, then you also know that one of my big goals for the year is to declutter my whole house. Let me tell you, there’s a reason this is so popular right now. I feel so much better from just the projects I’ve finished already. I started with my kitchen (which The Home Edit advise against, oops! ), but I can now find everything I need, and my cabinets aren’t filled with things that I might use sometimes. By using the change of seasons to start decluttering, you might be surprised to find things that are perfect for decorating during the spring. You might choose to put aside your heavier decor (like things with dark wood) and highlight your brighter and lighter decor. If your shelves are currently stuffed, you might not even realize what you have. Now that the leaves are coming back on the trees and flowers are blooming, you can start bringing the outside into your home with plants and fresh flowers. I personally kill every plant I touch, so I’m sticking with fresh flowers, but adding some plants to your shelves or corners can breathe new life into your space. I don’t know about you, but I love candles. On Saturday mornings, I make a cup of coffee and light a few candles around the house so the scent drifts throughout the house while I clean. During the winter, my favorite candle smells like a Christmas tree, but now that it’s spring, that candle just makes me wish that our stockings were still hanging on the fireplace. So, it’s time to switch out your candles (or diffusers, if that’s your preference) for new scents. There’s a reason people do big spring cleanings - since it’s so cold during the winter months, your house was closed up and collecting dust. Now, it’s the time to throw your doors wide open and let the fresh air in. Then, clean everything. Sure, it will take longer than everything else on this list, but you’ll feel better when you’re done. I’ve always been a big fan of rearranging - when I was younger, I would rearrange my bedroom furniture about once a month. It’s an easy way to feel like you’ve created an entirely new space without spending a single penny. So, if you feel like you’re in a rut and that no amount of floral throw pillows can pull you out of, rearrange. Start with the vignettes on your shelves (so you don’t have to ask for help moving your furniture), then rearrange your furniture so you have new sight lines and a brand new room. How are you sprucing up your home this spring? Share your tips below, or head on over to Facebook and share pictures of your spring decor in our Facebook group!